Located close to the amenities that the town of Annan has to offer, this two bedroom apartment would suit a first time buyer or buy to let investor! Providing Lounge with Bay Window, Dining Kitchen with Integral Appliances, Two Bedrooms with excellent storage and Shower Room. On Street Parking and Rear Garden with Garden Shed included in sale. Entrance Hall with wall light and smoke alarm. Window to side with blinds. Two ceiling lights, smoke alarm, dado rail. Large storage cupboard with ceiling light and shelving. Radiator, laminate flooring. Bay window to front with curtain rail and blinds. Coving, ceiling light, smoke alarm, dado rail. TV point, telephone point, gas living flame fire with wooden surround. Radiator, laminate flooring. Window to rear with blinds. Two ceiling lights, smoke alarm, CO2 detector. Range of wall and base cabinets, integral oven, four ring gas hob. Stainless steel sink and drainer with mixer tap, plumbing for washing machine. Integral fridge. Splashback. Radiator, laminate flooring. Window to front with curtain pole, curtains and blinds. Ceiling light, TV point, telephone point. Large storage cupboard with shelving. Radiator, carpeted flooring. Window to rear with curtain pole. Ceiling light, large storage cupboard with window to rear with blinds, hanging rail and shelving. Radiator, carpeted flooring. Opaque window to rear with blinds. Recessed lighting, extractor fan. Half tiled walls. Three piece suite comprising of toilet, wash hand basin and shower cubicle with electric shower. On street parking. Rear garden with lawn and garden shed. 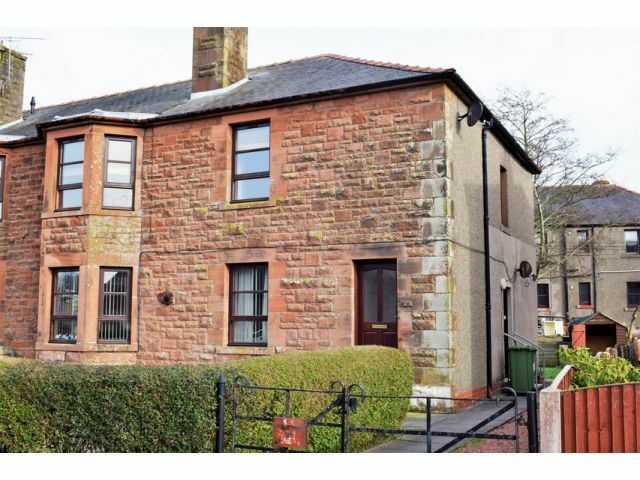 Offers in the region of £60,000 are invited and should be submitted to lj Residential, 93 High Street, Annan, DG12 6DJ or by fax to: 01461 205037.